Norman M. Naimark is Robert and Florence McDonnell Professor in Eastern European Studies at Stanford University. His latest book is "Stalin's Genocides." Dmitri Medvedev, President of the Russian Federation, has repeatedly pointed to the "massive crime Stalin committed against his own people," and the fact that Russians still offer unacceptable excuses for them. Still, in anticipation of the sixty-fifth anniversary of the end of World War II on May 9, 2010, the mayor of Moscow, Yuri Luzhkov, announced that posters of Stalin would be plastered around the city as testimony to the Soviet victory in the "Great Patriotic War." Protests by civil rights group and liberals forced Luzhkov to cancel his plans. Indeed, all over Russia, in conjunction with the sixty-fifth anniversary, there were arguments and political clashes about what to do with the figure of Stalin. Was he a hero, as most Russians continue to believe, or a criminal, as President Medvedev has asserted? The Russians cannot be said to be engaging in the public "memory wars" of the sort that continue to roil the political landscapes of countries like Germany, Poland, and Spain. In fact, liberal opponents have criticized Medvedev's statements because, they insist, there have been no concrete actions taken by the government to back up the president's anti-Stalin rhetoric. The government-controlled television and radio stations, as well as the print media, do not allow an open discussion of Stalin's crimes. At the same time, if Russians wanted unalloyed information about Stalin's crimes, they could get it. Important scholarly studies are readily available in Russian bookstores. The one "free" Russian radio station, Ekho Moskvy (Moscow Echo) has broadcast a marvelous and lengthy series of interviews with Russian and Western specialists that openly explore diverse aspects of the history of Stalin and Stalinism in the country. For more than two decades, the Russian human rights group "Memorial" has engaged in the crucial work of collecting data and publishing materials relating to the history of Stalin's repressions. Unfortunately, however, the products of their labors have been confined to narrow circles of interested liberals and families of victims. No attempts have been made in Russia to place perpetrators on trial; school textbooks continue to evade the issue of Stalin's crimes; and the reputation of Stalin as a great Russian leader, if somewhat stained in some quarters, remains on the whole intact. Certainly very few Russians or even observers in the West would accept the judgment that Stalin's crimes of the 1930s amounted to genocide. The definition of genocide in the December 1948 Convention on the Prevention and Punishment of genocide confined the term to coordinated murderous assaults on national, ethnic, racial, or religious groups. But this was very much a politicized definition; the Soviets insisted that social and political groups be left out of the convention and the Americans and others agreed as a way to get it passed unanimously. If one includes social and political groups in the definition, the genocidal crimes of Stalin come into clearer focus. For example, the Soviet regime openly trumpeted the "elimination of the kulaks [a group of allegedly wealthy peasants] as a class." Tens of thousands were shot and another two million exiled to "special settlements," where they died in the hundreds of thousands from hunger, exposure, or disease. Recent research in the former Soviet archives has demonstrated that these settlements rarely had the provisions necessary to sustain the lives of the deportees. The Soviet leadership understood that they were sending the exiles to their deaths. Ukrainians claim, no doubt correctly, that the Ukrainian "killer famine" of 1932-1933, should be considered genocide. The lowest reasonable estimate of the number who died is some 3-5 million. Other parts of the Soviet Union suffered from famine, as well. But only in Ukraine were peasants systematically prevented by Stalin's leadership from seeking relief in the cities and from traveling to other parts of the country to find food. Order no. 00447 of July 1937, about which we knew very little until the last decade of archival research and publishing, authorized the arrests and summary trials of close to 800,000 allegedly "socially harmful people" —"asocials"—the chronically unemployed, prostitutes, vagrants, homeless, and "former people," ex-landlords, noblemen, tsarist government servants, and kulaks. In a shocking example of the genocidal character of Stalin's leadership, according to quotas set in Moscow and arbitrarily raised by the police in the provinces nearly half were shot and the others exiled to special settlements, where many died in horrible conditions. Stalin and his lieutenants also attacked nationality groups, which are traditionally considered the primary objects of genocide. 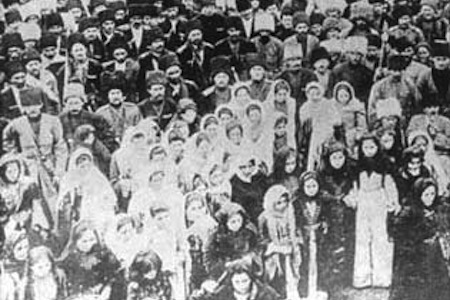 Over 170,000 Koreans were exiled from the Far East region in October 1937; Soviet Poles and Germans were arrested, deported, and executed in large numbers beginning in 1934; the entire Chechen-Ingush and Crimean Tatar nations were forcibly deported from their homelands to Central Asia in 1944, which was the cause of a huge number of deaths, by some estimates up to forty percent of their total populations. In one of the best-documented cases of mass murder, Stalin and Beria ordered the execution of 22,000 Polish officers and administrative personnel in early 1940, the so-called "Katyn Forest Massacre." During the "Great Terror" of 1937-38, the major leaders of Bolshevism were tried publicly and executed. With them tens of thousands of party and state officials, military officers, administrative personnel, and their families, friends, and alleged associates were arrested, sometimes tortured, and executed, incarcerated or exiled. The total number of people who died "prematurely" during Stalin's reign has been estimated at 15-20 million, meaning Stalin literally decimated the population of his own country of some 170 million. 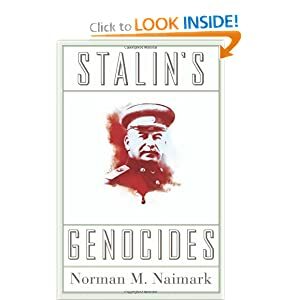 By thinking more broadly about the category of genocide and looking at Stalin's crimes cumulatively rather than as discrete episodes, there can be little question that the Soviet leader should be held accountable for genocide. The sooner the Russian population honestly confronts this reality, the sooner the country can heal the wounds of the past and move on to a more hopeful future. Medvedev is right; there can be no excuses for the crimes Stalin committed against his own people. Walter Laqueur: Murder! Madness! Terror! I don't know what was taught as history in Soviet times, nor what is taught there now. But it does seem bizarre that Stalin is considered a hero of WW2 by any knowledgeable person. After all, he helped the war get started through the Nazi-Soviet Pact [regrettably Prof Neimark does not discuss it here]. Without that pact, Hitler would have had to find another means of starting the war. By his alliance with Hitler and his joint invasion of Poland with him, Stalin certainly made possible the Holocaust, that is, the genocide of the Jews, including Soviet Jews. Somehow, Stalin usually gets off the hook as one of the collaborators, wittingly or not, in the Shoah. So do Chamberlain and the British govt generally, who actively tried to prevent Jews from escaping from Europe and also illegally prevented Jews from finding refuge in the internationally designated Jewish National Home, Israel, as part of their 1939 White Paper policy, which prevented Jewish refugees from finding refuge in their National Home when they most needed it. Ironically, after Hitler attacked the USSR, hundreds of thousands of Jews from Poland, Ukraine & Belarus were able to find refuge in Soviet Central Asia, thus escaping the Shoah. Added to these were many Jews taken prisoner in formerly Polish-ruled parts of Ukraine & Belarus between the Soviet occupation in 1939 and the German attack on the USSR in 1941. Although many of these people died in Soviet labor camps, many were saved from the Nazis by virtue of being in those Soviet camps. However, as one of my relatives from a formerly Polish-occupied part of Belarus told me, at the start of the German invasion the Soviet forces had orders not to let civilians flee to the east. My cousin got through with her family because she had once been invited to Moscow to meet Stalin as a delegate of the working intelligentsia of her town. She was smart enough to save the invitation. So Stalin contributed mightily to the Holocaust, although ironically he also allowed many Jews to be saved in various ways. Two of my cousin's brothers were killed in the battle of Stalingrad, so that was another way that the war got population killed off. One might also mention that the soft, Walter Duranty treatment of the Stalin regime by prestigious Western press organs helped to cover up Stalin's genocidal doings.